You’ve probably heard the term “lean manufacturing” at some point in your career, and perhaps your facility takes that approach to their production process. But, there’s also a subsection of lean manufacturing called cellular manufacturing. Cellular manufacturing aims to move the production process along as quickly and efficiently as possible, while making a variety of similar products, using little waste, and encompassing group technology. The assembly fashion—involving the use of multiple cells or work areas—makes cellular manufacturing a successful process for many manufacturing applications. In a cellular manufacturing setup, work areas are arranged in an assembly line fashion, and each work area has its own set of machines and equipment to accomplish a specific task. Each work cell is developed to complete a different part of the manufacturing process. Cellular manufacturing is advantageous for its fluid movement and flexibility. Many of the machines in each work cell are automatic—lathes, drill presses, overhead cranes, etc. Since most of the machines are automatic and versatile, it becomes very easy for workers to make simple changes to their process when needed. This allows for scaling the size of the product quickly and easily, making minor changes to the design itself, and even overhauling the entire project. Cellular manufacturing can be a tedious process to implement, but once it’s put into place, the production process improves greatly. So, now that we’ve defined the process, let’s take a look at the best overhead lift equipment to supplement cellular manufacturing. There are several overhead lift systems that are often used in cellular manufacturing, but some of the more popular systems are either small enough to fit into one singular work area or large enough to cover all of the work areas combined. 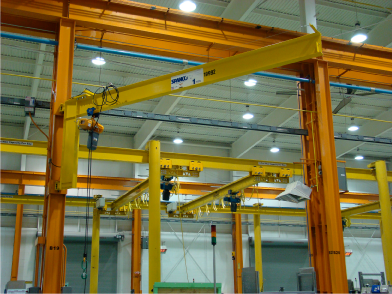 Wall-mounted jib cranes, for example, are a perfect solution for your lifting needs in an individual work area. Not only do they require no floor space, they also fold out of the way of other machinery and equipment. They provide excellent clearance—above and beneath the boom. Wall-mounted jibs can be mounted directly to a column or wall, making them an ideal choice for individual work areas. Workstation bridge cranes are an excellent option to supplement your jib cranes, and they serve a much different purpose in this type of operation. 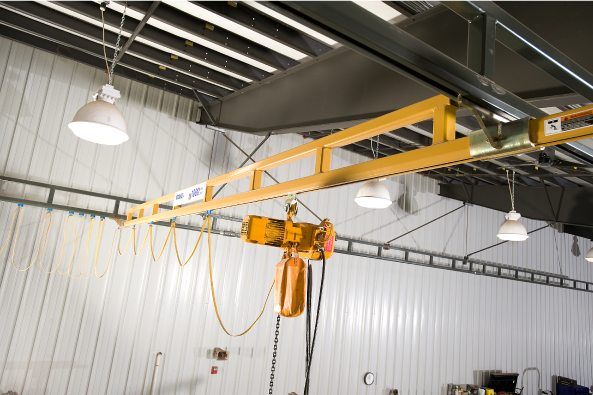 A ceiling-mounted workstation bridge crane also leaves floor space unobstructed, and drop hangers allow you to install the crane at any height within your building’s structure. Workstation bridge cranes provide a rectangular (or square) coverage area and can be interconnected to create one fluid system that covers your production process from top to bottom. What’s more, ceiling-mounted workstation bridge cranes allow you to expand runway lengths and the number of bridges traveling on the runway. They also allow you to add links to monorail systems, which brings us to our last overhead lift system: monorails. 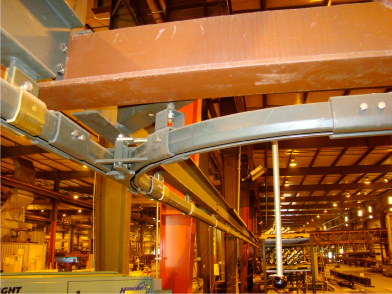 Monorail systems are perfectly ideal for cellular manufacturing processes that require lifting and moving products along a fixed path. They have unlimited span, meaning they can cover as much space as possible. Ceiling-mounted monorails also require no floor space, leaving extra room for equipment, machinery, and the entire production process. 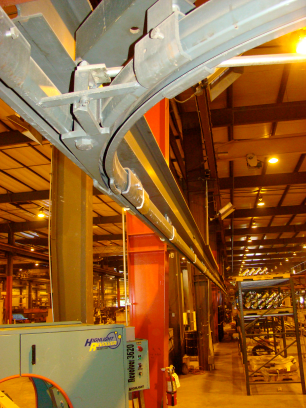 Monorail systems are very flexible, which is another reason why they work so well in a cellular manufacturing environment. They can include curves, slopes, multiple tracks, switches to multiple spurs, turntables, interlocks, and entry/exit sections. They can also connect to other systems like workstation bridge cranes and conveyors, making your entire setup ergonomic and extremely efficient. 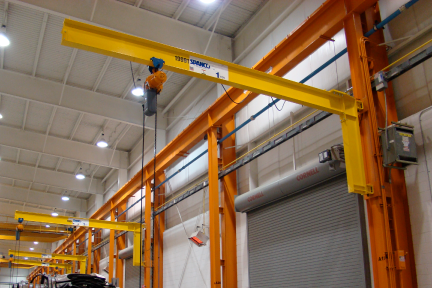 Whether you’re looking to cover individual work areas or the entire length of your building, overhead cranes are an excellent addition to most cellular manufacturing processes. If your factory is using cellular or lean manufacturing, we would like to hear from you! What type of lift equipment are you currently using throughout your process, and how is it working out for you?